Studies show that the safest place for your child to ride in the car is the backseat. However, simply riding in the backseat isn’t enough to ensure your passengers’ safety. Certain precautions should still be taken for both children and adults riding in the back to reduce their risks of injury or death. When you’re in the market for a vehicle, keep backseat passengers in mind. The average car on the road is 11 years old, but there have been many advancements in car safety just within the last decade. Some particularly old cars aren’t even equipped with headrests, which are key to protecting passengers’ necks from whiplash. However, many newer models come with safety features just for the backseat, like side airbags and inflatable seat belts. Buying used is the budget-friendly way to go, but try to get a car that is at least fewer than 10 years old if you can. Being equipped with the proper restraints is the most important factor in child passenger safety. Determine whether your child needs a car seat, booster seat, or seat belt based on his or her age, weight, and height. Not sure what to trust? Use this handy page from the National Highway Traffic Safety Administration to determine which restraints are best for protecting your child passenger. Believe it or not, the middle seat is the safest seat in the entire car. It offers the most distance from impact during a collision, so the middle passenger is more likely to be protected from a crash in any direction. Just make sure the passenger is wearing a 3-point seatbelt. If a lap belt is the only option, they’re better off sitting in a window seat. This one seems so obvious, but distracted driving is still the number one cause of car accidents in the U.S. It is always valuable to remember that activities like talking on the phone, texting, reading, grooming, or eating compromise the safety of you and your passengers. 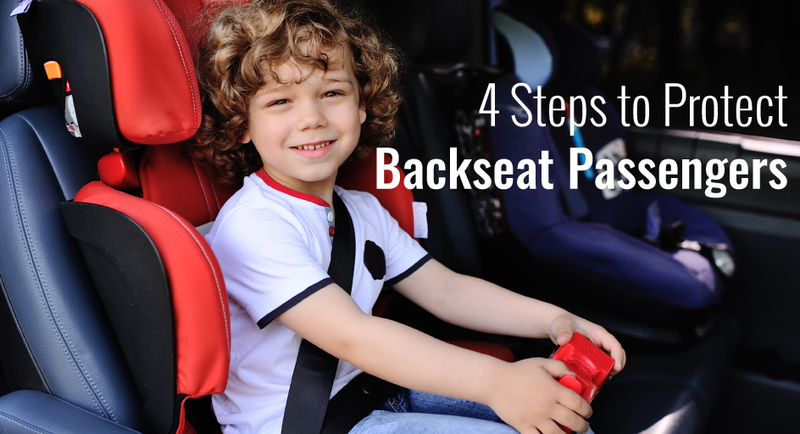 Remember these tips when you’re buying a car, picking out a carseat for a child, or just running an errand with a friend. The backseat is known as the “safe seat,” but there are definitely measures you can take to make it even safer and protect the ones you love. Make sure you’re covered in case of an accident or injury with the right insurance plans! Talk to one of our agents today about your coverage options.